CONTEXT: Mortality due to noncommunicable diseases (NCDs) has increased worldwide and, according to the World Health Organization report in 2012, 68% of mortality was due to NCDs. In India, deaths due to NCDs in 2008 were 5.3 million. A rapid health transition is being experienced in India with a rising burden of NCDs. The first point of contact of patients with health services is primary health-care (PHC) facilities, which are the most appropriate places for patient screening and early detection. The National Programme for Prevention and Control of Cancer, Diabetes, Cardiovascular diseases and Stroke (NPCDCS) was launched in 2010 in India and in Belagavi district on September 29, 2015. Periodic evaluation helps to understand the problems a program is facing in managing and implementing so that appropriate modifications can be suggested. AIMS: To assess the implementation of NPCDCS at subcenters of Belagavi taluka. 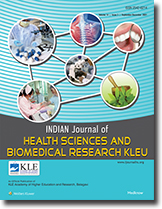 SETTINGS AND DESIGN: A cross-sectional study was conducted in Belagavi taluka of Belagavi district, Karnataka, from January 1, 2017, to December 31, 2017. SUBJECTS AND METHODS: The list of PHC centers and subcenters was obtained from the District Health Office, Belagavi. Simple random sampling method was used, and three subcenters from each of the 12 PHCs in Belagavi taluka were selected, accounting to 36 subcenters. Permission from the medical officer at the PHC was obtained, the concerned auxiliary nurse midwives (ANMs) of the selected subcenters in Belagavi taluka were contacted, written informed consent was obtained from all the participants, and the data were collected using a pretested, predesigned structured questionnaire based on personal interview by the investigator. STATISTICAL ANALYSIS USED: Rates, ratios, and percentages were calculated. RESULTS: The selected 36 subcenters in Belagavi taluka covered a population of 248,753, with a mean subcenter population of 6909. Nearly 63% of the subcenters were conducting the NCD camps weekly, with average number of NCD camps conducted per subcenter being 30/year, and the population screened for NCDs across all 36 subcenters was 64,096 accounting to 25.77% coverage. The prevalence of diabetes was found to be 4.87%, and the prevalence of hypertension was found to be 4.99% and, among the screened population, 69% of the ANMs had received training regarding NPCDCS and all the necessary equipment were adequate except for referral cards. CONCLUSIONS: NCD screening camps were being conducted at all subcenters and only 69% of ANMs had received training for NPCDCS and the necessary equipment and Information, Education and Communication materials were available at all selected subcenters for conduction of NCD camps.